I was driving to work early this morning and despite today being the first day of school for public schools, I was surprised to encounter heavy traffic so early as I approached the Santolan Station of LRT Line 2. Most commuters using the station were university/college students and workers but most of the latter won’t have school until next week and it was too early (around 5:50 AM) for most workers to be at the station given that offices open either 8:00 AM (government) or 9:00 AM (private). It turned out that there was a road crash involving a large truck and a motorcycle. 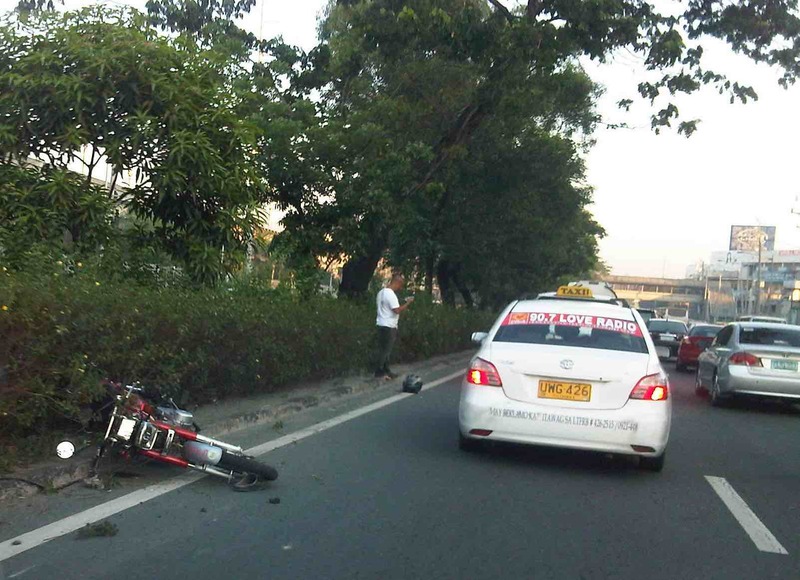 The motorcycle rider survived and was texting on the median island. A close look revealed that he was bloodied by the close encounter with the truck and that despite stopping, no one from the truck got down to check on the motorcycle rider. This has become a typical scene and fortunately (especially for the rider) it was not a fatal crash. Motorcycle involved in crash with a large truck (covered by taxi in the photo). a. For people driving large vehicles like trucks and buses: Always keep in mind that you are driving a large (and likely long) vehicle that has limitations in terms of manoeuvrability. Don’t drive as if your vehicle is a car and keep in mind that a slight mistake can lead to a fatal crash. b. For people on motorcycles: Always ride along lanes assigned to motorcycles or refrain from aggressive weaving or lane-splitting. 2-wheelers require balance and so anything to distract the rider (e.g., using cellphones while riding) or aggressive behaviour (e.g., speeding, frequent lane changing, etc. and their combinations) lead to the high likelihood of being involved in a crash. No matter how minor these may be (e.g., dents on vehicles) the cumulative impacts are still significant in terms of costs. c. For people driving jeepneys, UV Express and taxis: Always keep in mind that you are supposed to be driving safely as you are driving public utility vehicles carrying passengers whom you must convey safely to their destinations. This means you should exercise utmost care in driving and not doing because you simply want to earn money means you have no business providing public transport service. d. For people driving private cars: Follow traffic rules and regulations. Common causes of traffic congestion and road crashes can be the simplest violations. The more dangerous behaviour include counter flowing, speeding and cutting (or aggressive lane changing). e. For pedestrians: Cross at designated areas. If there are none or you choose to cross anywhere (i.e., jaywalk) make sure that you are alert and that there are clear gaps allowing for “safe” crossings. f. For cyclists: People using bicycles should use assigned lanes whenever available. Admittedly, there is a lack or absence of bike lanes in most Philippine cities and the reality is that these will not be provided in an instant. And so cyclists should also be responsible and exercise care as they pedal along. “Sharing the road” also means cyclists need to follow road traffic rules and regulations. They are not excused, for example, from stopping at intersections when the red light is on disregarding one way streets. With the onset of the wet season, roads will be slippery from rains and therefore add to the challenges of ensuring safe roads. We should not forget that every road user is a vulnerable person. Vulnerability is not limited to the pedestrian or cyclist though they may be the most vulnerable, often with little protection that will allow them to survive collisions with motor vehicles. Though valuable time can be lost by exercising extra care and discipline on the roads, the time cannot substitute or compensate the possible loss of life and limbs due to crashes. By d0ctrine in Behavior, Motorcycles, Road Safety on June 1, 2015 .